The Saint is back. 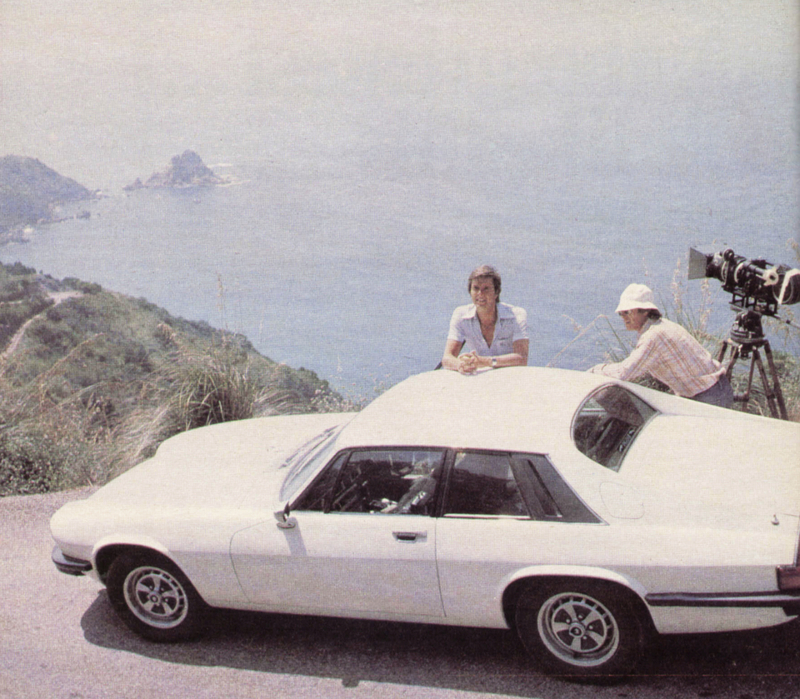 Super hero Simon Templar, played by Ian Ogilvy, has a new white charger – a sleek Jaguar XJS which bears the registration number ST 1. The dynamic duo have already embarked upon yet another battle against evil. 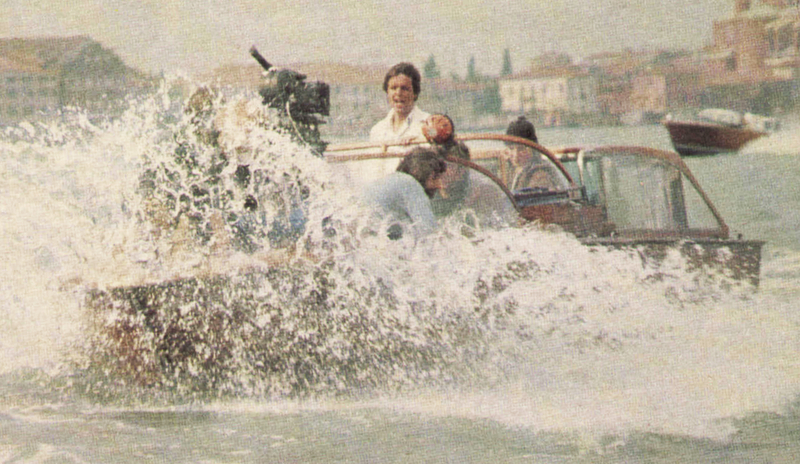 The new Saint, while filing in Italy, spoke about how it feels to follow the likes of Roger Moore. IT IS unashamedly escapist and, at a cost of £3 million, the new Saint series has never had it so good compared to the 1962 version which starred Roger “James Bond” Moore. That was done on a shoestring and borrowed bits of film for the outdoor shots. 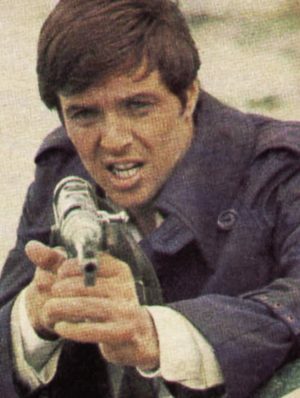 The Return of The Saint, starring Ian Ogilvy, is sumptuously presented in luxury locations entirely suitable to the character and preposterous charm of the hero created by Leslie Charteris way back in 1928. Nine episodes have been shot in Italy and on Monte Argentario, a mountain island resort favoured by the wealthy, the crew and cast booked comfortably into 75 rooms, spread over three hotels. After breakfast, they took to the hills in a convoy of mini-buses, complete with a set of props which included a bazooka, dynamite and Russian-made machine-guns. In a country where every other person seems to be under police protection for fear of being kidnapped or assassinated, the props were no mean achievement. It is a nervous country where private gun licences have been revoked and all use of real weapons by the film industry prohibited. But it is also a country where pulling strings has become a national pastime. The unit intervened with the Ministry of the Interior, who intervened with the police, who… anyway, they got the weapons. 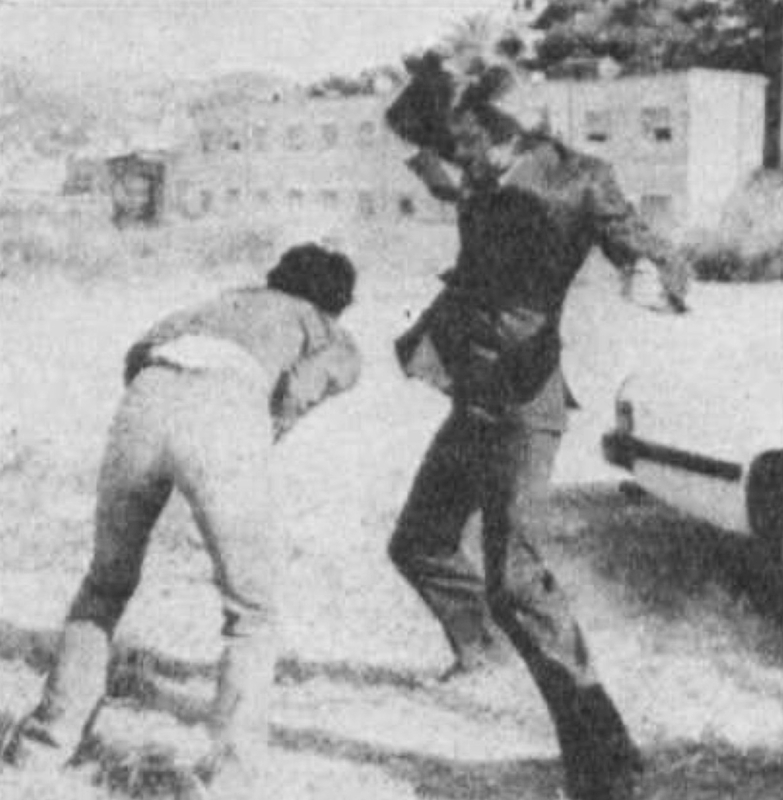 I lay on dusty mountain grass, alongside various prone carabinieri, who may have been real policemen or extras hired for the episode, and observed for the first time the man on whom ATV’s £3 million investment rests. Much has been written of Ian Ogilvy’s striking resemblance to Roger Moore. Both director and producer sometimes forgetfully call him Roger. My first impressions were basically of marvel. How, for instance, did Ogilvy keep his white pants looking impeccably pressed, and his hair so shiny and groomed? On the set he was always dazzlingly immaculate. Handsome to the point of being pretty. Between takes, a small battalion of make-up girls dashed forward with assorted powder puffs and brushes to dust him down and spruce him up. But there were signs that after five solid months of location filming he was near exhaustion. It may explain why Ogilvy was not enthusiastic for press interviews or keen to pose for pictures. At Monte Argentario, a separate villa was provided for him and his wife Diane, a former model, who has been with him throughout the months of filming. People have tended to assume, he says, that they have a claim on his time, but when work is over for the day, he gives his attention to his wife and two children, Emma, 15, and Titus, 9. A year ago, Ogilvy declared blithely that he had sold his soul to TV for 12 months, and they could do with it what they liked. Now, as the hour-glass runs out, he has taken a long, cool look at his commitments, and his situation as a professional actor. We talked during a sudden downpour, sitting in the Saint’s Jaguar. It is a beautiful car which has been his virtually a year. He must often have to remind himself of his own second-hand Austin 1100, costing under £200, parked outside his four-bedroomed semi in South London. This sleek speedboat features in a forthcoming episode shot in Venice. After 14 years as an actor, the closest he has come to fame, he says, is when his local wine merchant said to him: “Your face bothers me.” Now, with the Return of The Saint the days are ticking by for anonymity. “I don’t very much look forward to that. It is terribly nice to be anonymous,” he says. Unlike Simon Templar, Ian Ogilvy smokes. Lighting one after another with the rain pouring on the roof of the Jaguar he tried to put the Saint experience into perspective. He says: “I suppose, of the people I know who could have played this part, and there are quite a few, I would say 50 per cent of them wouldn’t have done it. I am one of the 50 per cent who would. “I have been in this business 14 years. I have spent most of my time at the BBC doing highbrow shows, not through any choice of my own. But I have got a period face, and I can wear the clothes. Because of that, I am not terribly well known in England. Or indeed anywhere. “A lot of people say that if you are going to do anything big, it’s best to do it in your 30s rather than when you are younger. Well, I’m 35. If this could be considered as something big, and I think it probably could be, then I think I have done it at the right time. With glamorous co-star Gayle Hunnicutt. Ogilvy is an Old Etonian who had ambitions to go on the stage when it was much more fashionable to be working class from almost anywhere “Up North”. His father was a brilliant Cambridge scholar and a leading light in the advertising industry. When anyone asked Ogilvy where he went to school, he replied: “Slough Tech.” His first job was as assistant manager and sweeper-upper at the Royal Court Theatre, London. He met his wife on a flight to Italy when both went to audition — unsuccessfully — for a part in a Zeffirelli film, The Taming of the Shrew. His major television roles so far have been in Moll Flanders and I Claudius. He also played Elizabeth Bellamy’s impotent husband in Upstairs, Downstairs. He was spotted for the Saint by producer Robert Baker in a small second-feature film six years ago. “I had lunch with Bob at Pinewood Studios,” says Ogilvy. “He said he wanted to do the Saint again, would I play the part? It is nice that nobody else was ever considered so far as Bob was concerned. And I had a very long time to make up my mind. With blonde co-star Judy Geeson. “Obviously Roger Moore is the Saint everybody remembers, though quite a few actors played the part. I’m about the 12th. It’s like Tarzan. “The character of the Saint has never been a problem. The Saint has no character. Nor does James Bond. This is what makes them successful heroes. Heroes are what you make them. A hero with a character has to have a special word invented for him — anti-hero. “I just try and be myself. The reason you get a part like this is, presumably, because people think you look like a hero. Therefore I see no point in trying to be anything but myself in a very glamorised and romantic situation. “My main difficulty has been with the scripts. They say things like ‘The Saint brings the speedboat neatly into port and jumps out.’ Well, anybody who thinks about it knows that it takes quite a long time to manoeuvre a speedboat and jump out. And who ties it up? “‘The Saint fires a bazooka from a cab window.’ You think of a cab window, and a bazooka, which is like a five-foot long drainpipe. You have to get it into the cab, then stick it out of the window while moving. It’s not easy. “The funniest instance was when I had to walk out of the water in a wet-suit with scuba gear. Anybody who knows about scuba gear realises that you can walk out of the water in it only if you walk backwards. “‘Right,’ said the director, ‘take the flippers off in the water and put them in a waterproof bag’ — which turned out not to be waterproof. The moment I stood up it had about 50 pounds of water in it. The air tanks weighed about 75 pounds. With all this gear, I literally staggered from the water. “Then we go into this whole process where the script says ‘the Saint slips out of the scuba gear.’ You don’t slip out of scuba gear. You need help. “So the way we finally did the scene was with a man kneeling down, trying not to get into camera shot, taking the weight of the tanks, while I tried to look beautiful and act. “For a ski episode, the plot called for an avalanche, which had to be created with dynamite. And with his brushed-up ski-ing ability dating from the age of 14, Ogilvy struggled gamely, heroically on. “The director said: ‘Ski up to the body and stand before it.’ I said: ‘The skis will be sticking straight through him.’ ‘Well, turn this way,’ he replied. That way, I slid down the mountain at 50 miles an hour. Nobody thinks it out. There turned out to be only two ways I could stand next to the body. “It is very hard work convincing people that just the ordinary business of filming is exhausting. It’s not just remembering the words. It is looking pristine all day. “The crew can come in with jeans and feel terrible if they have had a hard night. But they can still operate, and walk around with their eyes half-closed. I have to come in looking lovely, and remain looking lovely, and that is hard work, believe me. “After working all day I am tired. But nothing like as tired as I am on my day off. On my day off I am shattered. I keep going to sleep. I keep thinking — why am I so tired, it’s my day off? “I usually get up at the crack of dawn, say 6.30. I don’t eat breakfast, just have a cup of coffee. I am taken to wherever the wardrobe and the hair people are. Usually a hotel. I spend half an hour fiddling around. Then I go to the location and stay till the light fades. I get home about eight, have a quick dinner, and go to bed. That has been my day for five months as the Saint. “Having my wife here is vital. Quite apart from the companionship, which is the important part, there is the purely practical side. Most people here, sooner or later, have to think about laundry. Everything like that, she takes off my hands. “Now, I suppose the publicity machine will swing into gear. The grown-ups — that’s what I call the people in charge — say I will have to go to America and do chat-shows. Nobody is going to pay me for this. I am a working actor, I need to earn my living. They believe it still carries on, you see. But quite honestly, I would like another job after this is finished. “Obviously it would be nice to know what happens next. Three things could happen, I suppose.